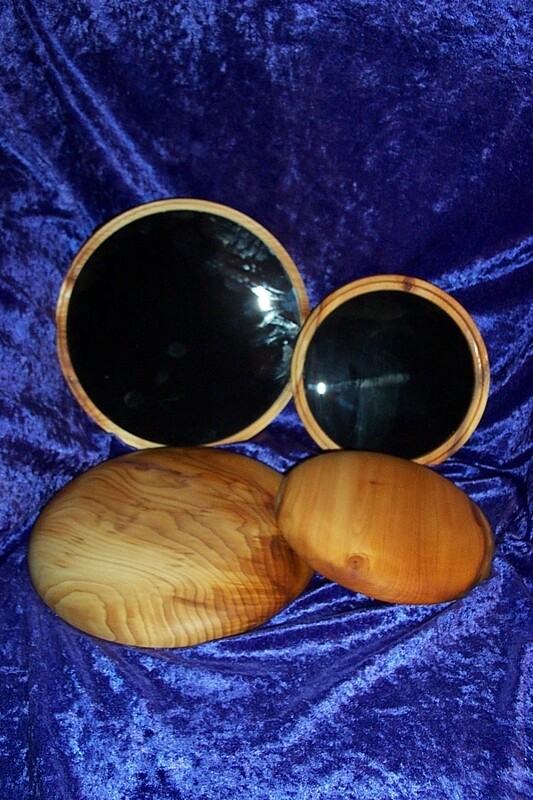 UNIQUE TO WITCHCRAFT ARE OUR OWN RANGE OF OWN DARK MIRRORS IN HAND-TURNED CELTIC HARDWOOD CASES. THE BOX IS OF COURSE TO PROTECT YOUR MIRROR, BUT WE HAVE ALSO CAREFULLY SELECTED OUR FOUR MAIN 'STOCK' TIMBERS - YEW, BEECH, ASH AND OAK, TO BE IN SYMPATHY WITH THE FUNCTION OF THE GLASS. EACH OF THESE SPLENDID BRITISH TREES HAS CONNECTIONS WITH DIVINATION. THE CHOICE IS YOURS, BUT WE HAVE VERY LIMITED YEW STOCK AND WE FIND IT IS NOT SUITABLE FOR THE LARGER SIZES. THE TIMBER FOR OUR BOXES IS AS FAR AS POSSIBLE FROM RENEWABLE SOURCES. THE DARK GLASS IS MADE MAGICALLY, USING VARIOUS INGREDIENTS INCLUDING MUGWORT, A HERB WELL KNOWN FOR ENHANCING DIVINATION AND WITCHES SIGHT. SIZES REFER TO THE MIRROR ITSELF - YOUR CASE WILL ACTUALLY BE ABOUT 1" LARGER. WE WILL ALSO MAKE THESE TO YOUR COMMISSION - IN ANY BRITISH HARDWOOD, AND WE CAN STAIN OR PICKLE THE WOOD DARK IF YOU WISH (WE USUALLY HAVE JACOBEAN OAK IN STOCK).. OR IN SUPERB PURPLEHEART OR AFRICAN BLACKWOOD (DARKER THAN EBONY) IF YOU WISH TO HAVE NATURAL DARKNESS ALL ROUND YOUR MIRROR. WE HAVE PREVIOUSLY SOURCED SOME 3000 YEAR OLD BOG OAK FOR THESE BOXES, WHICH CAN BE BLACKER THAN EBONY, AND HAS THE MOST INCREDIBLE ANCIENT ENERGY EMANATING FROM IT. ALTHOUGH SUPPLY IS IRREGULAR, WE MAY BE ABLE TO OBTAIN MORE - JUST ASK! DUE TO THE RARITY OF THESE MORE EXOTIC TIMBERS, PRICES WILL VARY. Please note that there is a delay on these items of at least 2-3 months, due to their complexity and limited lathe time! APPROX 2 inch GLASS MIRROR PROTECTED WITH RESIN SURROUND, SUPPLIED WITH A POUCH AND INSTRUCTIONS. THESE HAND-CRAFTED MIRRORS ARE MADE BY A WORKING WITCH, WHO BELIEVES IN KEEPING THE CRAFT SIMPLE. THEY WORK WONDERFULLY WELL, AND ARE EASY TO CARRY ANYWHERE. APPROX 1.5 inch GLASS MIRROR PROTECTED WITH RESIN SURROUND, SUPPLIED WITH A POUCH AND INSTRUCTIONS. 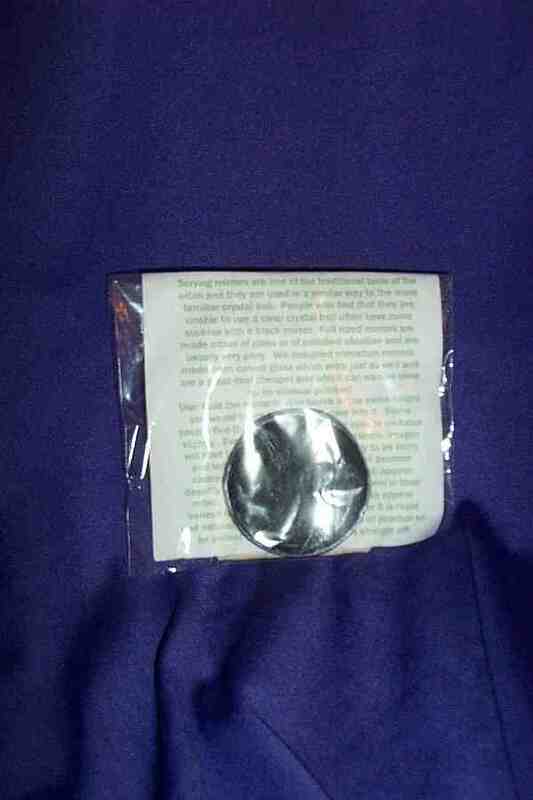 APPROX 1.25 inch BLACK GLASS MIRROR PROTECTED WITH RESIN SURROUND, SUPPLIED WITH A POUCH AND INSTRUCTIONS. This item has limited availability. 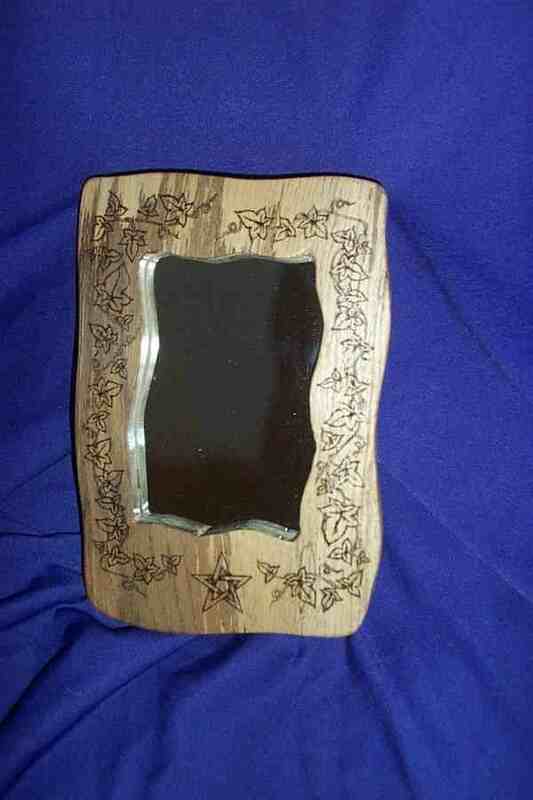 Flat glass mirror in Gothic or rustic frame in hardwood or Pine - deliberately rough-cut - and then polished & pyrographed. These are superb. Plain Mirror glass available if required. I make these beautiful magickal tools myself in our own Avalon workshops - so please be patient when ordering them! Each one takes several hours to make, and the mirror has to be worked in the correct moon phase. All this means it can take 2-3 months for me to finish your mirror. According to our clients - the wait is WORTH IT! Our mirrors are priced by glass size (the case will be about an inch bigger). Available in your choice of Celtic timbers - email me your choice or enquire. Most timbers will aid divination, as well as protect your mirror. Available in your choice of Celtic timbers - email to choose or discuss availability. These will all aid divination, as well as protect your mirror. 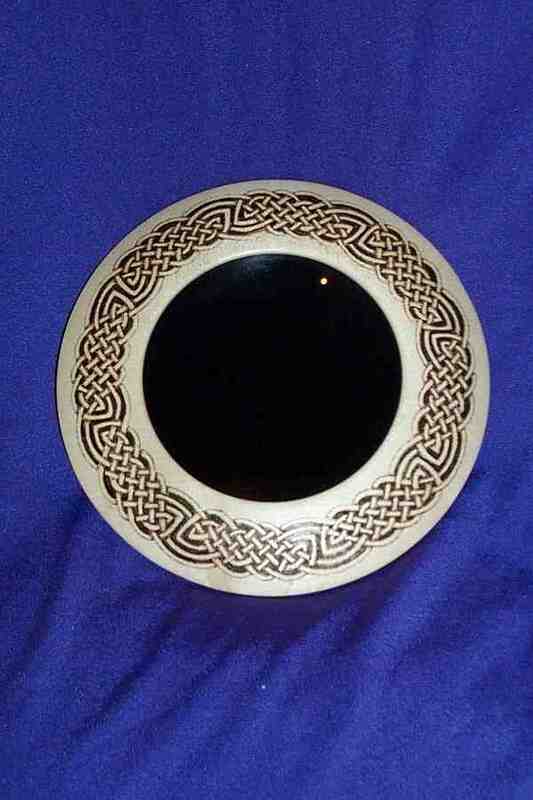 Available in your choice of Celtic timbers - most of which will aid divination, as well as protect your mirror. Please note - this size is not available in Yew - due to the poor nature of available timber. Available in your choice of Celtic timbers - email your choice or to discuss. These will all aid divination, as well as protect your mirror. Please note this largest size is NOT available in YEW. This is due to the instability of timber at this dimension.